In general, there are three primary components of the coronary system. 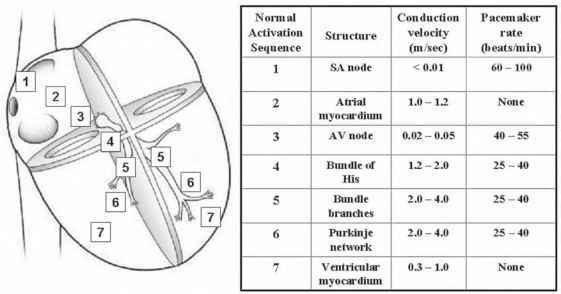 The first is the coronary arteries; this important group of vessels originates with the right and left main coronary arteries, which exit the ascending aorta just above the aortic valve. The smallest of the arteries eventually branch into arterioles. In turn, the arterioles branch into an extremely large number of capillaries, the smallest diameter vessels, which make up the second vessel system. Next, blood exits the capillaries and begins its return to the heart via the venules through the third component system of vessels, the venous drainage of the heart. Thus, the coronary veins drain the deoxy-genated blood from the myocardium back to the right atrium, in which it joins with the systemic deoxygenated blood entering from the superior and inferior venae cavae. quite detrimental and/or often deadly. For example, changes in electrocardiograms can be recorded within beats when there is inadequate blood flow delivered to a region of the heart. More specifically, whenever coronary blood flow falls below that required to meet metabolic needs, the myocardium is considered ischemic; the pumping capability of the heart is impaired. and there are associated changes in electrical activity (e.g., increased risk of fibrillation). Prolonged ischemia can lead to myocardial infarction, commonly called a heart attack. This can cause permanent, irreversible myocardial cell death. Coronary artery disease remains the most common and lethal cardiovascular disease in the US population affecting both males and females (1).